Welcome to Princess Cays! Located on the southern tip of Eluthra in the Bahamas, Princess' private island offers plenty of options so you can do as much - or as little - as you want. Let's explore! 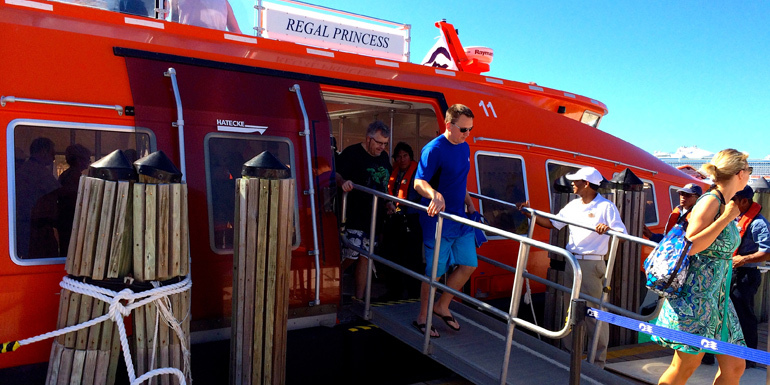 Since there's no dock at Princess Cays, your ship's tender boats will ferry you to the island. At the end of the day, lines to tender back to the ship can be lengthy, so you'll want to queue at least 30 minutes before the announced last tender time. Princess Cays has a beach with plenty of lounge chairs and shade structures. There are clamshells available for rent, which accommodate up to 2 loungers. They're just steps away from the water. Want to play? You can rent floats and snorkels to have fun in the warm Bahamian water.The shore line is a bit rocky, so bring your water shoes if you want to go for a walk in the surf. If you're looking for water sports fun, rent one of the dozens of kayaks, surfboards, or other vehicles on offer. The island hosts two grill/BBQ pavilions where galley staff from the ship prepare lunch ashore. There are grill and BBQ favorites to choose from, including hamburgers, hot dogs, BBQ chicken, ribs and salad. The fresh fruit bar is a great stop for dessert, and there are plenty of covered picnic tables for seating. Several bars are scattered around the island, offering an extensive tropical drink menu. For those looking for more privacy or a home-base from which to explore the island, consider a Bungalow rental. There are a limited number of Bungalows, and they do sell out, so you'll want to reserve yours in advance. The Bungalow includes an air conditioner, light, ceiling fan and shower. Towels and two floats are provided and there's plenty of space to stash your back-pack or beach bag. For an add-on charge per-person, a gourmet picnic lunch is available offering appetizers, BBQ and pastries. Roaming waiters provide bar service throughout the day to all Bungalow guests, and normal drink prices apply. For adults looking for even more privacy, a limited number of Sanctuary Bungalows are available on a private stretch of beach. Kids can keep busy on Princess Cays at Pelican's Perch with a playground and kiddie pool. Local artisans and straw merchants offer their wares for sale at stands and kiosks throughout the island, and a store features official Princess Cays merchandise. You can use your cruise card to charge purchases in the bars and store, but the local artisans only accept currency (US or Bahamian). Restrooms, lockers, showers and a First Aid station are available on the island. 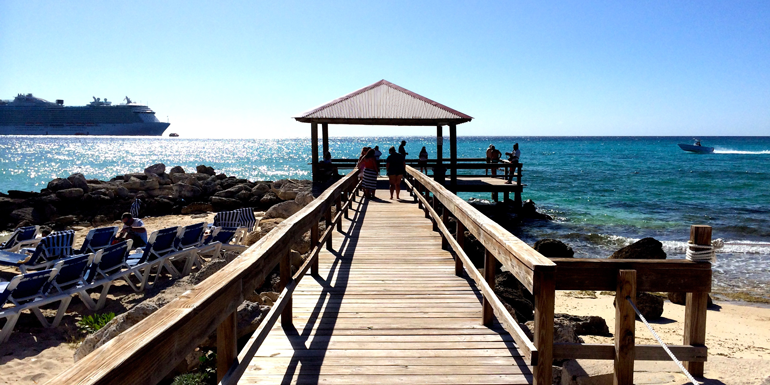 What's your favorite thing to do on Princess Cay?